Stampin' Up! Black Friday and Beyond! 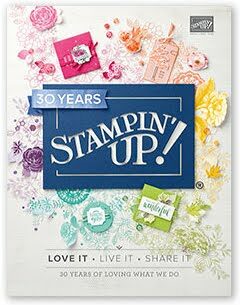 Save 30%-50% on fabulous Stampin' Up! products during the Online Extravaganza, which goes through Black Friday and ends at 11:50pm MST on November 30! 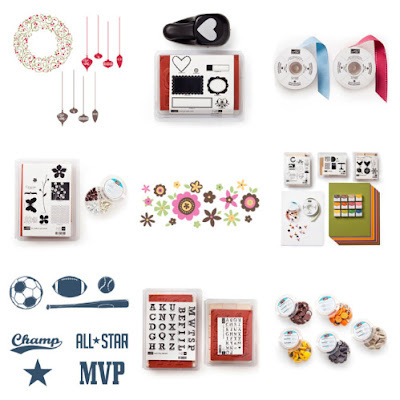 There are awesome bundles of products for card making and scrapbooking, as well as Décor Elements for home décor (even for girls and boys bedrooms), and single accessories or accessory packages (which make GREAT stocking stuffers for UP TO 50% OFF! See the graphic below for a small sampling of your choices. Right-click HERE to download your full-color sales flyer! Click to SHOP THE ONLINE EXTRAVAGANZA NOW! This container is for the regular size Tic Tac packages, the ones that are 5/8 oz. size. This box makes a cute little purse pack, just put a little velcro tab under the front flap to keep it closed. The Tic Tac package is not adhered to the box, so you can use the box over and over by putting a new package of mints in the box. These make great stocking stuffers, party favors, or treats for co-workers. 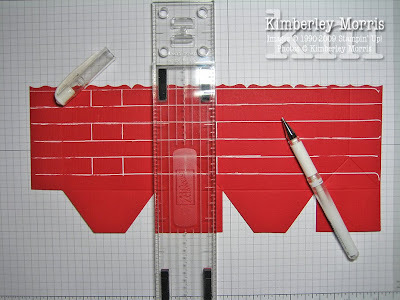 Click HERE to download the Tic Tac Box Pattern. 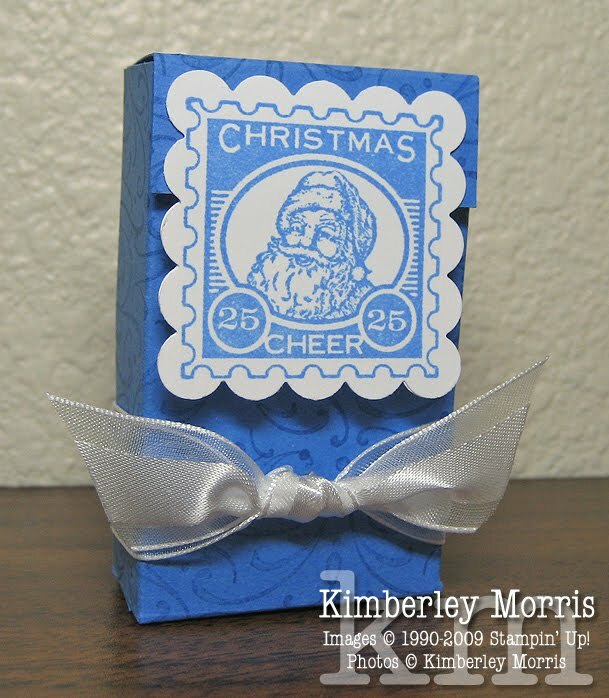 Stampin' Supplies: Christmas Punch (Hostess exclusive) stamp set, Stampin' Around Sweet Swirls wheel, Ballet Blue ink (stamp image), Brocade Blue ink (wheel image), Ballet Blue card stock, Whisper White card stock, Scallop Square Punch, Whisper White Organza Ribbon, Sticky Strip. About a million years ago, I created a box like this for the Tic Tac Big Pack. You can see that box and download that pattern HERE. Sometimes I get an idea and I just have to stop everything and run with it. This morning, the thought of using the Bigz XL Fancy Favor die as a chimney came roaring between my ears, and out my hands as the project you see above. Just look at that huge bag of Hershey Kisses he tried to drag down there with him (I hope he was going to my house). No wonder he got stuck! There are several steps to creating this project, but none of them are difficult. 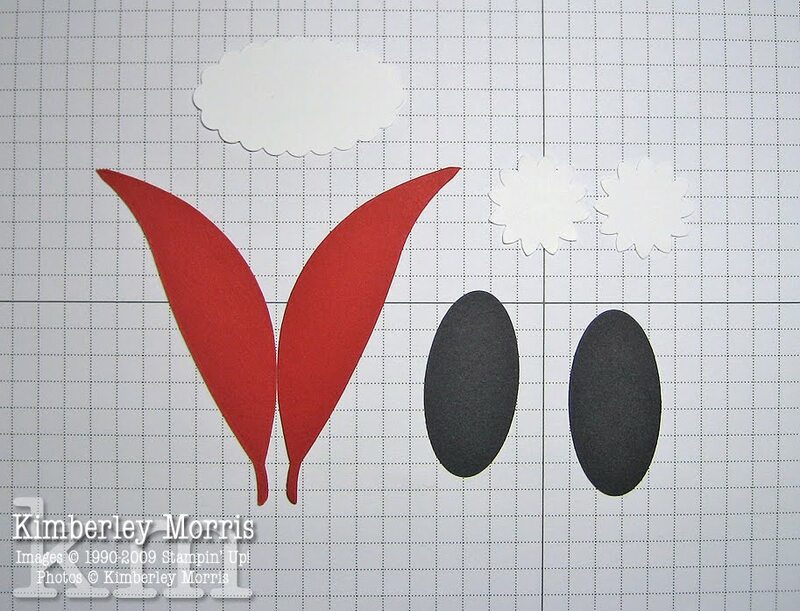 You should be able to follow along with the pictures below to recreate this box yourself. You could create your own box and pattern for the Santa legs, but I LOVE using the Big Shot die cutting machine and our Stampin' Up! punches because they make this project so fast and easy. If you've never seen or used the Big Shot, check out THIS VIDEO for a quick demonstration and a few projects. The first thing I did was to cut a box out using the Big Shot and the Fancy Favor Bigz XL Die. 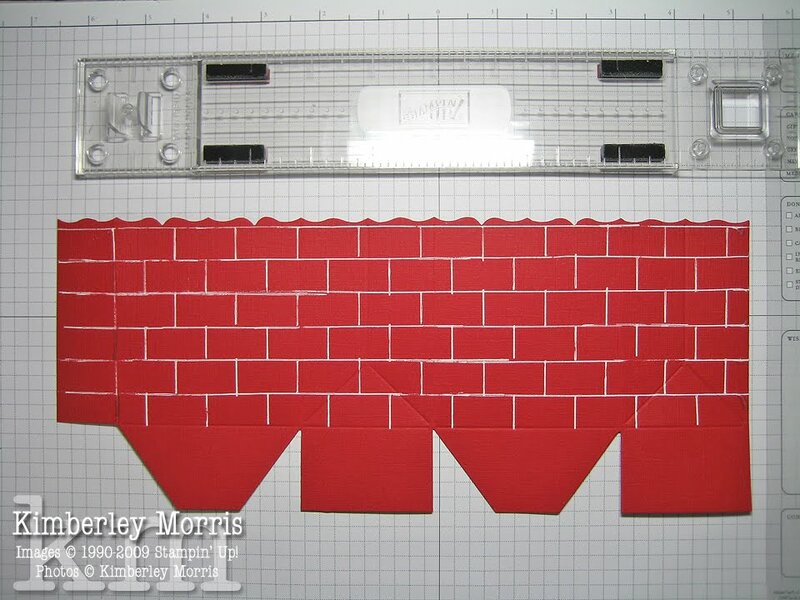 I cut the box from Real Red Textured Card Stock, because this box is supposed to look like bricks. 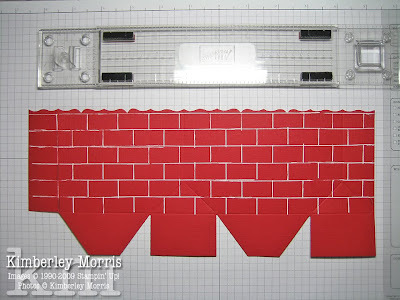 Then I took my Stampin' Around Wheel Guide, and my White Gel Pen, and started laying the bricks on the chimney, as you can see in the pictures below. 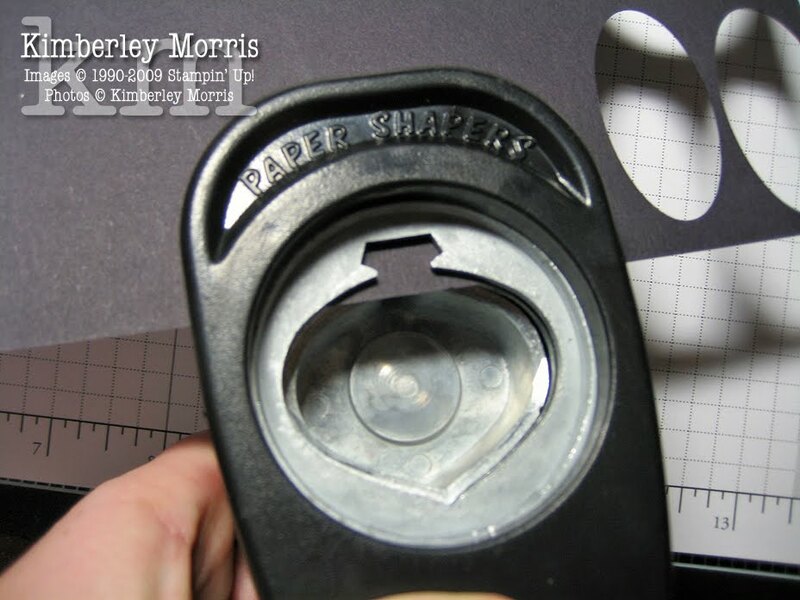 Because the Stampin' Around Wheel Guide is clear acrylic, you can see right through it to align your new marks with the previous ones. There are also etched lines on the acrylic you can use for alignment to get your spacing even. I made my bricks two lines tall, and 4 lines wide. You can see on the picture above that I messed up on some of the lines on the right hand side. I really don't care because it adds a little character, but some of the errors were just too ugly to leave untouched. No problem, you can take a Real Red Stampin' Write Marker and color over the bits of the White Gel Pen marks you'd like to cover. Just be sure the White Gel Pen marks are dry first! Because of later steps, your corrections will blend in nicely. You want to offset your bricks in each row, so when you lay your vertical lines, be sure to skip a row between each mark, like you can see I did in the picture above. 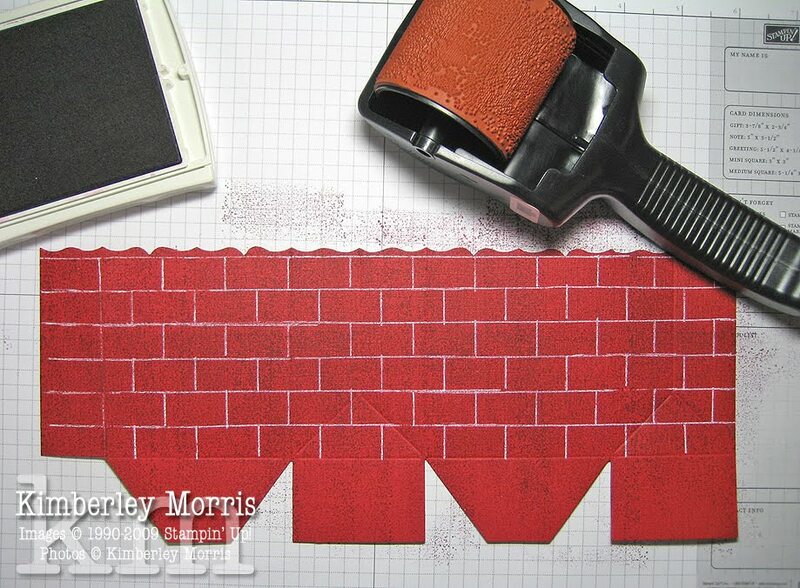 Then go back and lay the marks in the opposite rows, between the marks of the existing bricks. Look at the picture below for a visual on the finished markings. Next, you will use the Jumbo Texture Wheel, inked up with a Rich Razzleberry Classic Stampin' Pad, and just ink and roll, then RAN (repeat as necessary) to get the look you want. I love this part, because there's just no screwing it up! I like to go over the surface horizontally, then go over it vertically, a number of times. You can see that the corrections I made over those stray White Gel Pen marks are barely noticeable at this point. Then you'll want to run 2 small pieces of Real Red Card Stock through the Big Shot with the Leaves #2 Die, to get two of the long thin leaves. These will be Santa's legs. I used regular card stock to have a little contrast between the chimney color and the legs, but you could use Textured Card Stock again if you'd like. The Oval Punch makes the shoes from Basic Black Card Stock, the Boho Blossoms Punch creates fluff at the tops of the shoes from Whisper White Card Stock, and Whisper White is also used with the Oval Scallop Punch to create the fluff you'd see at the bottom of Santa's jacket. Then all you need to do is attach the finished Santa legs to the inside of the box at the top front. I highly recommend Sticky Strip adhesive for this step. Then cut a 1" x 3-1/2" strip of Basic Gray Card Stock to adhere across the front center of the chimney. Fill a Large Cello Bag with seasonal treats, and tie closed with Real Red 3/4" Polka Dot Grosgrain Ribbon. 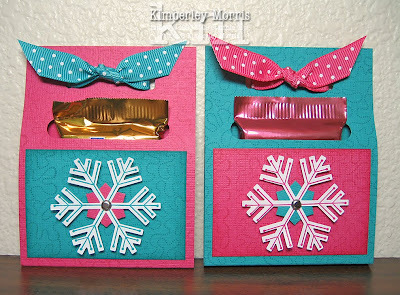 Give the treat box as is, or use the Two Tagz Die to create a cute folding tag with a greeting that you can tie onto the box. If you're just a little bit twisted like me, you might find it amusing to cut some letters out of Whisper White Card Stock using the Billboard Decorative Strip Die and slap "OH OH OH" on the outside of the chimney! The only thing holding me back from that is that fact that I don't own that die yet. 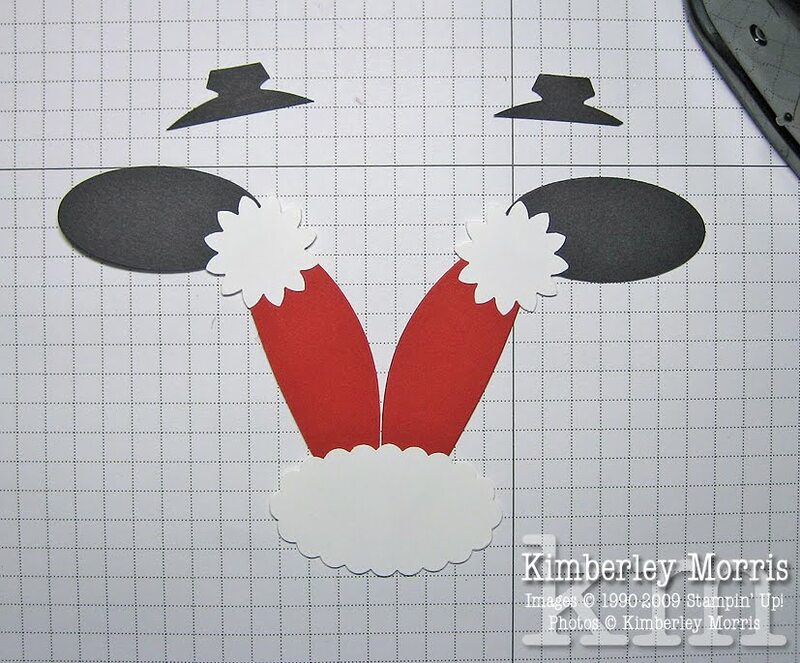 Be sure to visit my ONLINE STORE to get your Big Shot and holiday Stampin' Supplies today! Check out the Clearance Rack while you're there, and get 80% OFF surplus inventory. There are some great holiday items in there, like felt snowflakes and ribbon, and skinny silver tins you can decorate and use to give gift cards and cash! 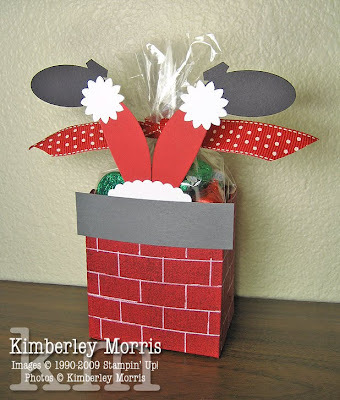 Check out the original tutorial for this treat holder HERE. This pattern is an oldie, but a goodie! As always, feel free to click on the images in this post to see full-size pictures. 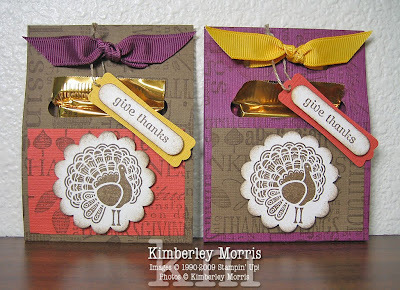 You can make your treat holders simple (see pic below), or add the 'give thanks' saying to each treat holder on a tag (as shown above). I wanted to make these for you a good while back, but life got in the way. Among a million other things, we even had a trip to the E.R. yesterday--but everyone's okay, thankfully. The kids have a full week's break from school next week for Thanksgiving, so they can recover and rejuvenate! And I can SLEEP IN!!! Aren't these treat holders cute? I've never seen such adorable turkeys. Don't you want to put these on your Thanksgiving table??? The cool thing is that you can take out the treat and eat it, and you don't have to rip the holder to do it. So, you could replace the chocolates and use the treat holders at your Thanksgiving table in future years if you really wanted to. Or, you could be a total turkey and eat the chocolate, then carefully tuck the wrapper back in the holder and prank someone else into thinking they're getting a treat...lol! Yeah, you're right, that's mean. But you will probably be around family next week and if you do it to your older brother who's always been a turd to you, aren't you just facilitating karma? There are a few items listed in bold--if you purchase those now in my ONLINE STORE, you'll have a few of the items you'll need to make some treat holders like the ones shown below, for Christmas. (Be sure to check out the Clearance Rack while you're shopping--you can get up to 80% off surplus inventory!) And, for every order of $50 or more that you place with me, your name is put in my monthly drawing for a FREE STAMP SET! 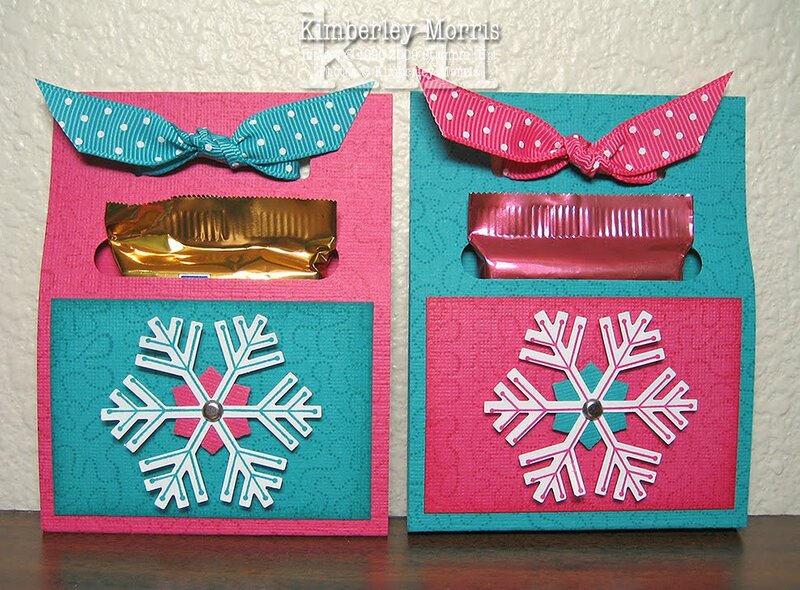 I'll post the remaining supplies needed for these snowflake treat holders after Thanksgiving. If you want to order the supplies from my ONLINE STORE right now, drop me an email and I'll send you the detailed list so you don't have to wait.